Kwame Dawes (book: Duppy Conqueror), whom I first heard at the GRD Poetry Festival, is always amazing to listen to, and his new poems were every bit as lovely as those nesting in my bookshelf. Cathy Park Hong (book: Engine Empire), had a great presentation and good concepts, but ultimately I enjoyed her stage presence more than her actual words (this might change upon reading her, but first impressions are what they are). Idra Novey (book: Exit, Civilian) floored me. Presentation, words, concept…all, the complete package. Her concepts and writing style reminded me of Matthea Harvey with their wit and humor on serious and introspective observations and topics. Patrick Rosal (book: Boneshepherds), playing up a bit of a rock star angle by delivering poems by memory, earned my purchase of his book with a sly (ultimately unintentional) reference to Whitman’s line “I am large, I contain multitudes.” Lastly was Stephen Motika (book: Western Practice), who seemed to have captured something in his writing that embodies West Coast living…have I mention I loathe the West Coast mentality? That was the only morning/afternoon presentation I ended up attending, because I was happily folding issue after issue of The Idiom for PHP. While the table was located in a back corner and saw little flow before noon, the post 12:00 pm crowd was an entirely different story. We could barely keep Idioms on the table. Everyone there took turns folding, stapling, and handing out the free literary magazine. Dogmatic was even painting with them and drew several admirers while doing so. 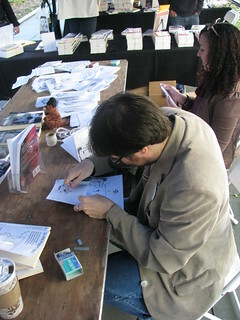 By 3:00 pm or so, the table had run dry of all 800 copies the independent publisher brought! 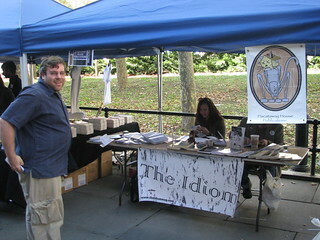 After the free goodies were gone, efforts were made to sell the other books offered by the independent publisher to modest success. We even put on an impromptu haiku reading to promote “5, 7, then 5 / we must tell a whole story / in just three short lines.” Pictured to the right are Keith and Erin Baird, hard at work on The Idiom assembly line at table 173. 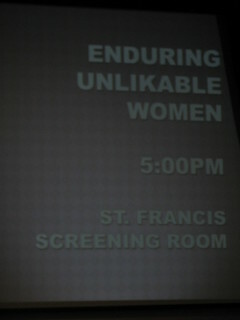 Since there were no more Idioms to prepare or hand out, I took my leave to check out the most interesting sounding panel of the day, “Enduring Unlikable Women.” Even the wait in line was enjoyable. Aside from hearing everyone around me talk all literary-like, passersby would constantly ask what we were all queued for, to which they’d get the inevitably abbreviated “Unlikable women.” You could hear the entire line ripple with a low chuckle each and every time. While the panel was comprised of authors I’d never heard of, the title and description were more than enough reasons to attend. Elissa Schappell (book: Blue Print), Gilbert Hernandez (book: Love and Rockets), and Dana Spiotta (book: Stone Arabia), according to the panel description, were accused of writing “difficult, complex female characters.” This translated to female characters who lived in life’s grey areas or in empowered positions that drew criticisms from certain factions of readers. The authors read from and discussed their works as both authors and readers. 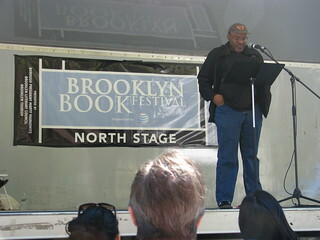 For some Brooklyn Book Festival visuals, check out PHP’s pics here and my own pics here.